The Red Hot Lindy Hop weekly lesson and session continues this Friday night. This week's lesson will be by Kirk and Kimmie, with music by DJ Kimmie. Free admission before 7:00 p.m., and $5 at the door afterwards. U of M Swing will take a Labor Day break, but return on Monday, Septmeber 13, in a new room, Fieldhouse Room 254 from 7:00 to 9:30 p.m. Free taster lesson from 7:00-8:00 p.m. Topics vary from week to week and include East Coast Swing, Lindy Hop, Charleston, Blues and Balboa. All are welcome and no partner is required. Open practice from 8-9:45pm. Improve your moves during this dance time. Ask questions, come practice your swing dancing and have fun with other Memphis swing dancers! Today's Sunrise Serenade had a historical bent: "Julius Caesar" by the Mills Brothers. Click on the song title to listen courtesy of Jazz On Line. 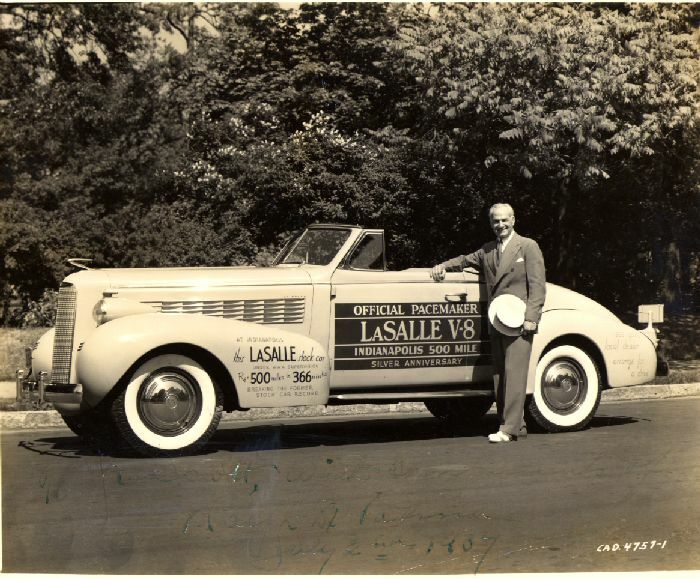 Hemmings posted this neat picture of Ralph De Palma, winner of the 1915 Indianapolis 500, in front of the La Salle Indianapolis 500 Pace Car he was selected to drive for the 1937 race. Can you imagine the sight of this car leading the field around turn 1? This morning's Sunrise Serenade was Louis Armstrong's 1941 version of "Peanut Vendor." Click on the song title to listen courtesy of Jazz On Line. Originally released in 1940, here is Warner Bros. version of a wildlife documentary: Wacky Wild Life. 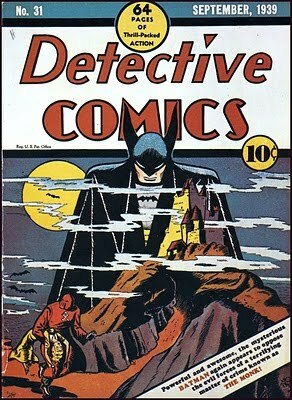 The Golden Age Comic Book Stories blog really lived up to its name with this post. It features over 30 comic book covers from 1937-1945, including many DC icons like Superman, Batman, Green Arrow, and Captain Marvel; as well as some lesser known (at least today) heroes like Bulletman. This morning's Sunrise Serenade was "Candy" by Nat King Cole. Click on the song title for a sample clip from ilike.com. I have not fully explored America in the 1930's yet, but one of the first links I found was A Day In Radio. 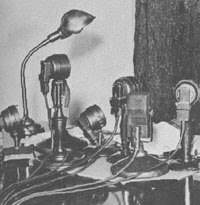 On September 21, 1939, WJSV radio in Washington, D.C. recorded the entire 19 hours of its broadcast day. That day of programming is available here. The playlist for the August 25, 2010 broadcast of the Swing Shift Shuffle has just been added to the playlist filing cabinet. Once again, Classic Movies Digest did a nice article on one of my favorite films, The 39 Steps. This early Hitchcock movie featured what would become one of his classic themes: an innocent, but wrongfully accused, man in a cross country chase being pursued by both the bad guys and the law. 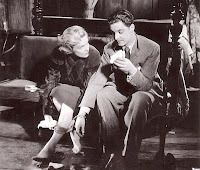 Robert Donat (of The Count of Monte Cristo fame) plays our hero, with Madeleine Carroll as his very reluctant accomplice. A great Hitchcock thriller. This morning's Sunrise Serenade had a decidedly barnyard flavor: "Boogie Woogie Piggy" by Glenn Miller and his Orchestra, with Tex Beneke on vocals. Click on the song title to listen courtesy of Jazz On Line. Live Music At The Lindy Hop! 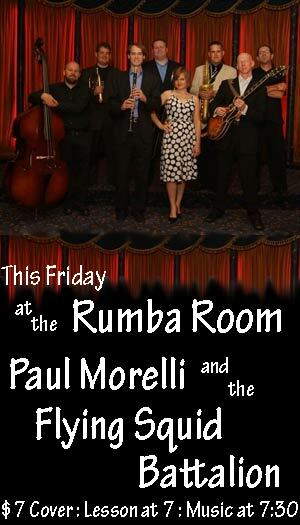 The weekly Red Hot Lindy Hop lesson and session will feature live music this Friday night by Paul Morelli and the Flying Squid Batallion. Lesson by Jaredan & Erin. Today's Sunrise Serenade was "Lulu's Back In Town" by Fats Waller. Click on the song title to listen courtesy of Jazz On Line. 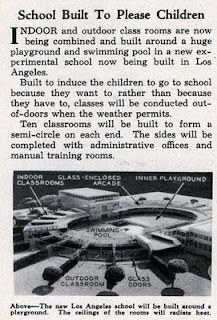 From the "I'll believe it when I see it" department: Modern Mechanix posted an item from 1935 about a proposed school in Los Angeles designed to "induce children to go to school because they want to rather than because they have to . . . ." I wonder how that worked out. The worlds most powerful rodent returns to save the day! In keeping with the wolf theme from last week's cartoon, this short from the 1940's features a wolf playing pied piper for some lambs with a little jazz before Mighty Mouse shows up to spoil the fun. There is about 10 seconds of picture distortion around 2:13, but otherwise the quality is watchable. From the Internet Archive, here is Mighty Mouse in "Wolf! Wolf!" Now this is a ride. 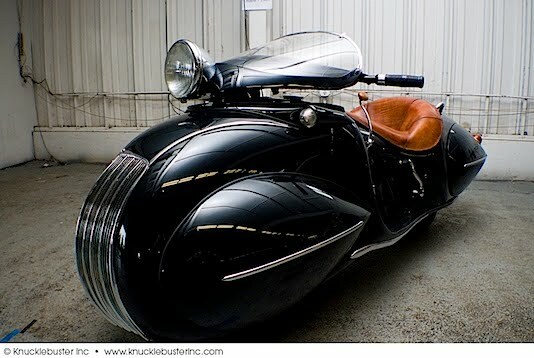 Make: pointed me to a post on Knucklebuster about this custom-made Art Deco motorcycle built in 1936 based on a 1930 K.J. Henderson motorcycle. More great photos at the post. I would say more, but I am too busy cleaning the drool off my keyboard. This morning's Sunrise Serenade was "Strictly Instrumental" by Harry James and his Orchestra. Click on the song title to listen courtesy of Jazz On Line. How more classic American comic book can you get than a great big, blue, burrowing, flying machine fighting the Nazis, complete with the U.S. Army Air Corps insignia? 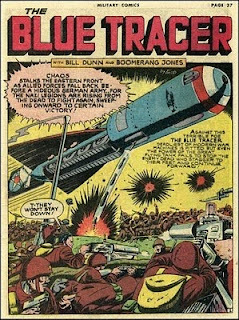 Golden Age Comic Book Stories posted scans from the December 1942 issue of The Blue Tracer. Today's Sunrise Serenade was "Swinging On The Strings" by the Ink Spots. Click on the song title to listen courtesy of Jazz On Line. The playlist for the August 18, 2010 broadcast of the Swing Shift Shuffle has just been added to the playlist filing cabinet. The weekly Red Hot Lindy Hop lesson and session continues this Friday night, and there will be live music next week. This week's lesson will be by Matthew and Becky, with music by DJ Becky. Free admission before 7:00 p.m., and $5 at the door afterwards. 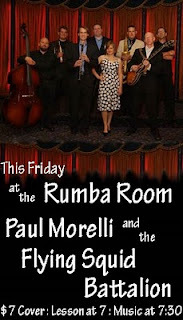 Next week, August 27, 2010: Paul Morelli and the Flying Squid Batallion provide live music for the Lindy Hop! Today's Sunrise Serenade was "Daddy" by the Andrews Sisters. Click on the song title for a sample clip from emusic. Click here for the emusic album page. Happy Birthday Mae And Maureen! There have been a lot of interesting birthdays lately, but I found this coincidence too much to pass up. The People History notes that Mary Jane West (a/k/a Mae West) was born on August 17, 1893, in Bushwick, New York; and Maureen FitzSimons (a/k/a Maureen O'Hara) was born on the same day in 1920, in Ranelagh, County Dublin, Ireland. Below is Ms. West in a trailer from I'm No Angel (1933), and a publicity shot of Ms. O'Hara from The Black Swan (1942). Click here for a trailer from The Black Swan on TCM. Today's Sunrise Serenade was "Just A Gigalo (I Ain't Got Nobody)" by Louis Prima. Click on the song title for a sample clip, and click here for the album page on emusic. Once again, it just goes to show that there is very little "new" under the sun. 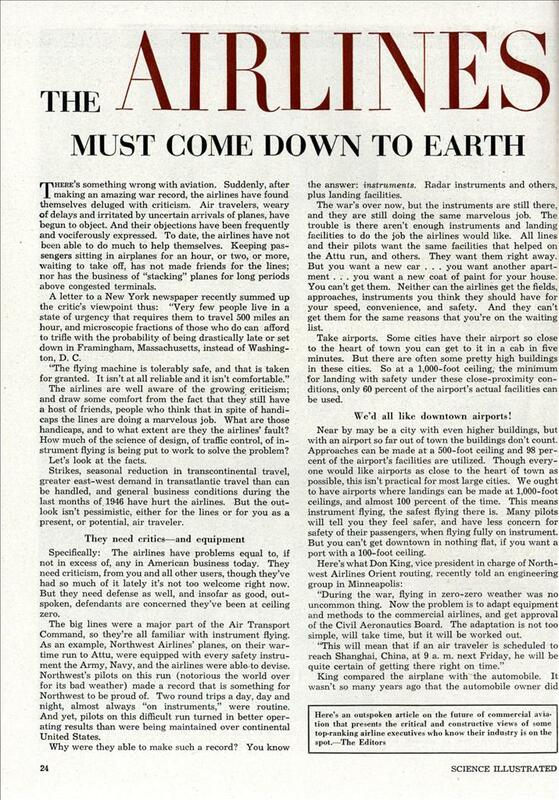 This article from a 1947 issue of Science Illustrated, posted on Modern Mechanix, sounds like it could have been written today. Does any of this sound familiar to you air travelers? Air travelers, weary of delays and irritated by uncertain arrivals of planes, have begun to object. And their objections have been frequently and vociferously expressed. To date, the airlines have not been able to do much to help themselves. Keeping passengers sitting in airplanes for an hour, or two, or more, waiting to take off, has not made friends for the lines; nor has the business of “stacking” planes for long periods above congested terminals. Today's Sunrise Serenade was "I Can't Give You Anything But Love" by Valaida Snow. Click on the song title to listen courtesy of Jazz On Line. This film is an U.B. Iwerks cartoon from the early 1930's featuring a fairy tale/nursery rhyme mashup. There is some nice early '30s jazz in this short. From the Internet Archive, here is The Big Bad Wolf. The People History pointed out that Alfred Hitchcock was born today, August 13 in 1899. Although it obviously does not happen every year, it is certainly appropriate when his birthday falls on Friday the 13th. 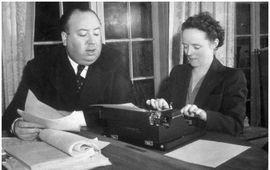 The photo shows Hitch with his wife, Alma in the mid 1930's. Today's Sunrise Serenade was "Rhythm Is Our Business" by Memphis' own Jimmie Lunceford and his Orchestra. Click on the song title to listen courtesy of Jazz On Line. I have always liked compactness. When I was very young, my parents had a small trailer as a summer place, and it had a fold-away table. 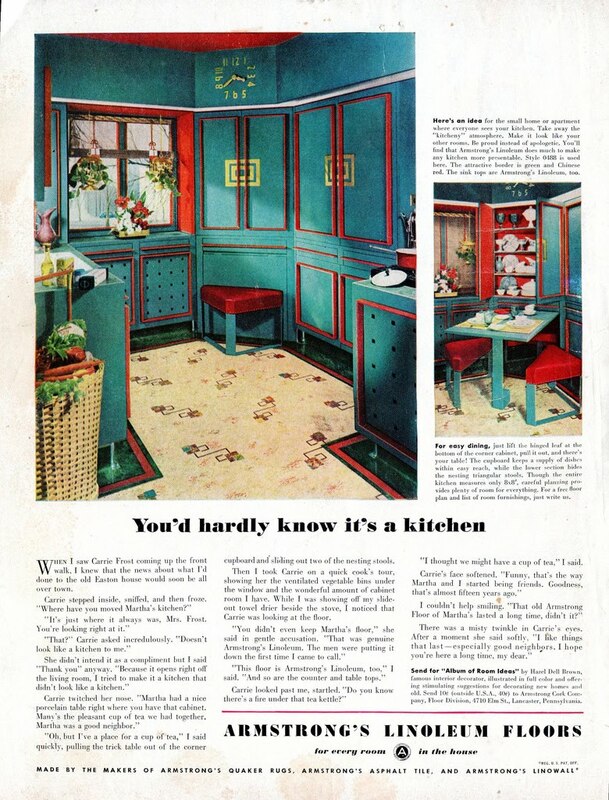 Boing Boing pointed me to the posting of this vintage ad from a 1947 issue of Better Homes and Gardens featuring a hideaway kitchen. This morning's Sunrise Serenade was "Rose Room" by the Benny Goodman Sextet. Click on the song title for a sample clip from emusic. Click here for the album page. The playlist for the August 11, 2010 broadcast of the Swing Shift Shuffle has just been added to the playlist filing cabinet. The Shadow started as a pulp magazine, then transitioned to radio, then to serials, and eventually (by 1994) to a full feature film. 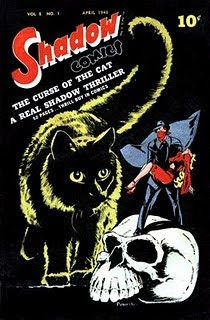 Pappy's Golden Age Comics Blogzine posted a scan of the comic book version from 1948 entitled "The Curse of the Cat." Who knows what evil lurks in the hearts of men? The Shadow knows. This morning's Sunrise Serenade was the always sentimental "Pistol Packin' Mama" by Al Dexter and his Troopers. Click on the song title to listen courtesy of Jazz On Line. Start the school year off right with weekly Red Hot Lindy Hop lesson and session this Friday night. Lesson by Mike and Jeska, and music by DJ Jeska. Free admission before 7:00 p.m., and $5 at the door afterwards. Today's Sunrise Serenade was "Barrelhouse Bessie" by the Gene Krupa Orchestra with Anita O'Day. Click on the song title to listen courtesy of Jazz On Line. 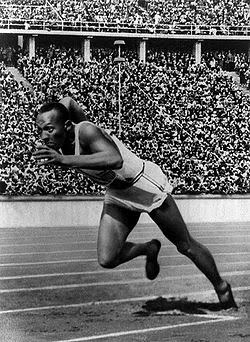 On this day in 1936, as noted by The People History, African-American athlete James Cleveland "Jesse" Owens, won his fourth gold medal at the 1936 Olympic Games in Berlin, Germany. Just before the competitions, Adi Dassler, founder of the Adidas athletic shoe company, persuaded Owens to wear Adidas shoes, essentially becoming the first sponsor of an African-American athlete. This morning's Sunrise Serenade was "The Jumpin' Jive" by Lionel Hampton. Click on the song title for a sample courtesy of emusic. Click here for the album page on emusic. Here is another one of those early cartoons. In this film, Mother Goose and company escape from a book for a little fun in the woods. From Van Buren Studios and the Internet Archive, here is the 1932 animated short, Nursery Scandal. 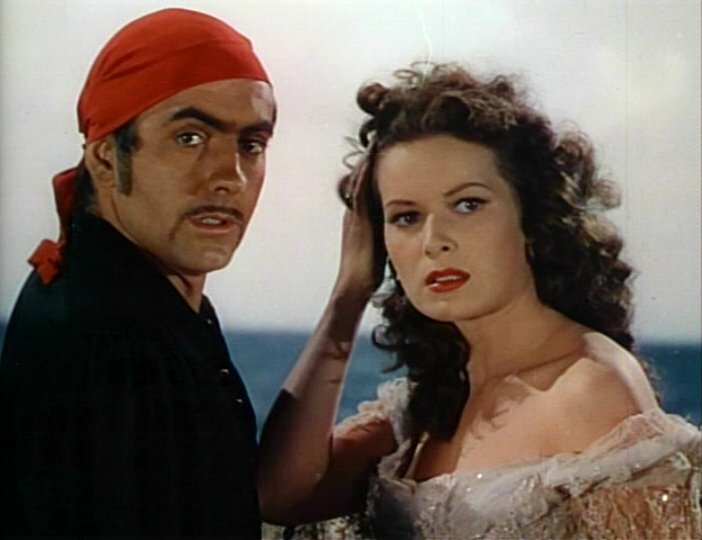 Born on August 6, 1911, Lucille Ball is best remembered for her movie and television comedy, but if you get the chance, check out Lured (1947). In this suspense thriller, Ball plays Sandra Carpenter, an American working as a rent-a-dance girl in London. When one of her friends apparently falls victim to a serial killer who has been luring women to their death via the personal column, Scotland Yard recruits her as bait. She shines in this part, one of her few dramatic roles, and still manages to make some very clever wisecracks. Adding even more weight to the cast is leading man/hero (villain?) George Sanders as the possible suspect and Ball's love interest, Charles Coburn as the Scotland Yard inspector, and a brief appearance by the ever menacing Boris Karloff. This morning's Sunrise Serenade was "American Patrol" by Glenn Miller and his Orchestra. Click on the song title to listen courtesy of Jazz On Line. 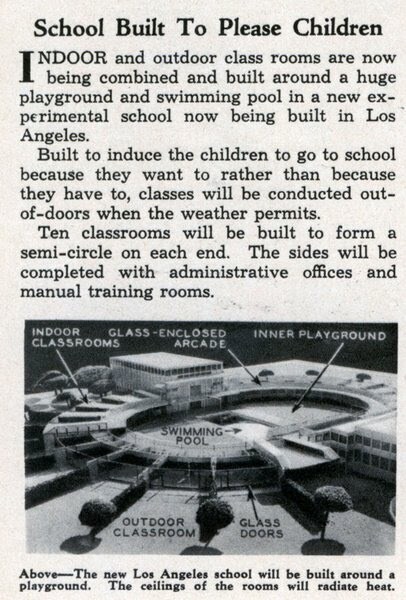 Everything looked faster in the 1930's, even when it was sitting still. 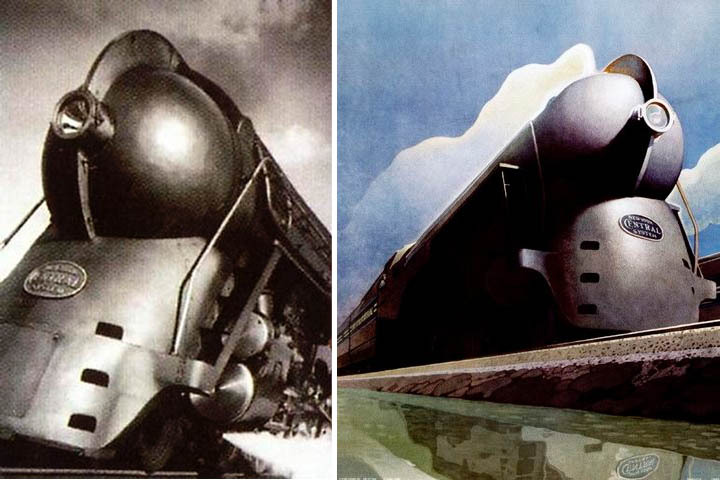 Boing Boing pointed to a post on Dark Roasted Blend that features dozens of train photos and prints, including quite a few art deco trains from the Golden Age of rail transport. One of my favorites is the print by Jack Juratovic of the 1935 Packard Aero Coupe racing a streamlined steam locomotive. This morning's Sunrise Serenade was "Sweet Sue, Just You" by Artie Shaw and his Orchestra. Click on the song title for a sample from emusic. You can find the album page here. The playlist for the August 4, 2010 broadcast of the Swing Shift Shuffle has just been added to the playlist filing cabinet. On August 4, 1901, Louis Daniel Armstrong was born in New Orleans, Louisiana, and the rest is history. 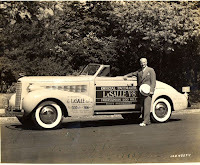 Below is an early film of "Pops" performing "Dinah" from 1933. Ella Fitzgerald returned for this morning's Sunrise Serenade with "A New Shade Of Blue." Click on the song title for the album page on Amazon. Sample clip at Track #18. Keep cool with the weekly Red Hot Lindy Hop lesson and session this Friday night. Lesson by Jaredan and Amanda, and music by DJ Amanda. Free admission before 7:00 p.m., and $5 at the door afterwards. This morning's Sunrise Serenade was "Tain't What You Do (It's The Way That You Do It)" by Ella Fitzgerald. Click on the song title for the YouTube page, or listen below. 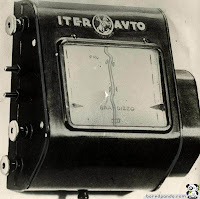 The Make blog posted about this 1930's version of GPS. The dashboard mounted map roll apparently advanced automatically corresponding to the speed of the car. I guess you were on your own if you took an impromptu side trip. 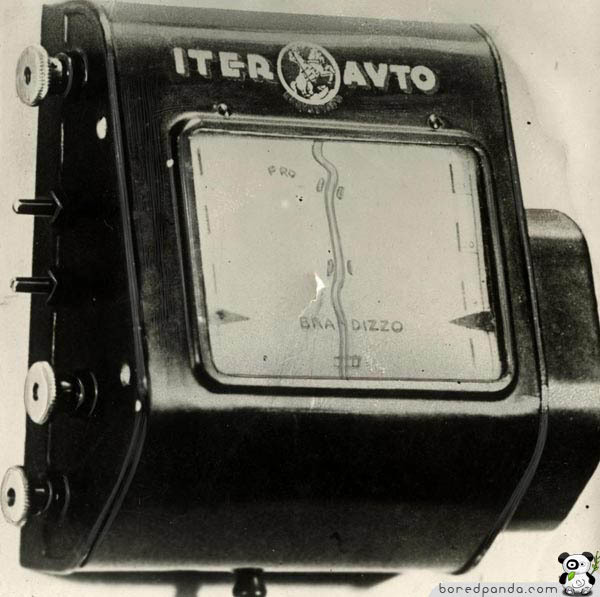 Devices very similar to this map reader are still used in some forms of off road motorcycle racing such as the Dakar Rally. Today's Sunrise Serenade was the delightfully contented "Roof Over My Head" by Louis Jordan. Click on the song title for the YouTube page, or watch below.